There is a lot of snark, action and fun filled dialog which are the most important things to me when it comes to reading a good book. White has created a wonderful cast of characters from Evie to Lend and all of the minor characters in between. For the first in a series, the pace is quite fast and you completely believe that there is this mirror world which every kind of creature imaginable. Evie's gift is that she can see what no human can and right past the glamor that these creatures use to hide themselves from humans. 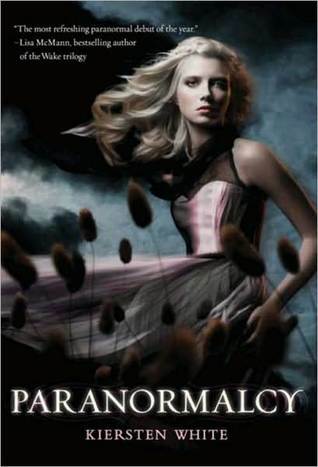 When Lend breaks into IPCA headquarters to find out why paranormals are being murdered, he is caught by Evie. Evie's teen hormones kick in and she finds Lend someone she would like to know better. Evie is not quite certain what Lend is, but he can mirror the looks of anyone he sees. Well, from there the story kicks off and looks to be a great set up for the series. It does sound great. I've had my eye on it, thanks for the reminder! I got this from the library this week and can't wait to read it. Thanks for sharing your review. I'm glad you loved this, it's one of my favorite books! Great review!